Hertha celebrating their second goal. | Photo: Hertha BSC. Niko Kovać suffered his first defeat in charge of die Roten as they are outplayed by their hosts. Vedad Ibišević’s penalty gave the hosts the lead in the capital with the league’s current top scorer Ondrej Duda getting a fifth of the season just before the break. 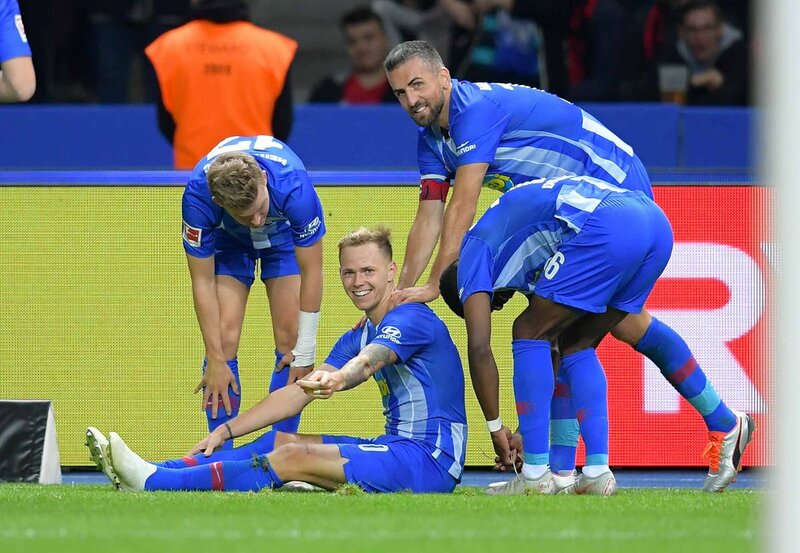 Bayern threw everything they had at Hertha in the second half, but they couldn’t find their way back into the game, with Hertha pulling level on points with them at the top. Bayern were looking to bounce back from dropping points against FC Augsburg in the week, but they were uncertain here as Hertha, themselves beaten by Werder Bremen on Tuesday, started positively. It was end-to-end football at the Olympiastadion, however the first clear chance fell from a Bayern corner, taken by James Rodríguez, with Jérôme Boateng left free to head over the bar. Robert Lewandowski also headed a chance wide after a Franck Ribéry cross. Hertha’s first big chance came when an Ibišević header was saved by Manuel Neuer after a cross from Ondrej Duda. Salomon Kalou and Boateng went for the loose ball, with the latter going to ground and eventually taking Kalou down. Referee Marco Fritz pointed to the spot, and Ibišević sent Neuer the wrong way to give the hosts a shock lead. Joshua Kimmich came close to equalising soon after the goal, turning past Karim Rekik before seeing his shot deflect wide off his own man Ribéry. Bayern struggled to gain any sort of authority on the game though, the next chance coming when David Alaba overlapped Ribéry, only to see his cross blasted wide by Arjen Robben. Niklas Stark had headed over at the other end for Hertha, who were more than holding their own, and they doubled their advantage just before the break. Duda set the move up, finding Kalou. His pass was past Alaba to find Valentino Lazaro, and his cut back found Duda, who finished things off by smashing the ball into the roof of the net. Bayern started on the front foot but Thomas Kraft, covering for the injured Rune Jarstein in Hertha’s goal, was largely untroubled. Efforts from Renato Sanches and Alaba were comfortably wide, whilst an excellent cross from Kimmich, headed on by substitute Thomas Müller, could not find Lewandowski. Hertha were having to sit back and were maybe a little fortunate little was made of a Lazaro tackle on Ribéry in the box. There had further luck when, from a Kimmich corner, a Boateng header was get out by Kraft’s fingertips, with both Lewandowski and Rodríguez missing the chance to threaten with the rebound. Nothing Bayern tried was coming off. As well as Müller, Kovać brought on Serge Gnabry and Sandro Wagner. Gnabry struck across goal, whilst Lewandowski headed a corner into the legs of Kraft, with Wagner putting the rebound effort well over. Hertha resisted everything else they threw at them, hanging on for a famous win. Niko Kovać had made five changes for the 1-1 draw against Augsburg, and six more here. Whilst this is a smart policy as Bayern look to challenge on all three fronts, their performances across both games have been far short of the high standards they set themselves. Individual performances may not have been terrible but the midfield trio of Thiago, Sanches and Rodríguez lacked incisiveness, whilst Robben and Lewandowski had very indifferent evenings and the substitutes couldn’t make much difference either. Kovać will need a result against Ajax on Tuesday to stave off talks of a crisis, yet over the course of the season, they could still reap the benefits of this rotation policy. Bayern haven’t had many bogey sides in recent years, except perhaps Borussia Mönchengladbach or any Spanish side, but this was a fourth game unbeaten for Hertha against them, even if it was their first win since February 2009. They drew twice last season, including this fixture around the same time of year, days after Carlo Ancelotti had been sacked. The Olympiastadion is also become an unhappy stomping ground for Bayern. As well as two draws against Hertha here, they also lost to Kovać’s Eintracht Frankfurt in the DFB-Pokal final in May. Their last victory here came in May 2016 against Borussia Dortmund. Duda has been Hertha’s breakout star so far this season, but Lazaro was the spark behind this display. Playing at right-back, he was caught out a couple of times defensively by Ribéry, despite the Frenchman’s advancing years, however going forward was showed no fear despite the calibre of opposition, putting in some superb balls from the right including the assist for the second goal. Lazaro was naturally the standout player, but the centre-back pairing of Stark and Rekik impressed as well, denying Bayern the quantity of chances they might usually expect. Ribéry was the one Bayern attacking player to come out of the game with much credit, deploying all the usual tricks on the ball, even if he couldn’t force a goal.